It’s almost midday when we stumble on a bearded bloke clutching the spotted kiwi, ten minutes drive from downtown Wellington. The nocturnal bird lies across the man’s lap, twitching her whiskers and blinking against unfamiliar sunshine. Her captor is plucking feathers, mindful of the creature’s ferociously clawed feet – his forearm is already crossed with angry red slashes. “Go ahead and pat her,” he tells us. So we do. Given that we are in Wellington for an urban family adventure, the intimate avian encounter is unexpected. ? ?But then, the kiwi’s day is not going to plan either. Back when we were hoovering down a hotel breakfast one block from the Beehive, this bird was sleeping off the night’s escapades in suburban Karori. Now, a Department of Conservation scientist is carefully tugging blood-filled feathers from her nether regions. ? ?The man is one of several charged with gathering DNA samples and counting the estimated 100 kiwi multiplying inside the city’s Zealandia wildlife sanctuary. Zealandia is also the place to see tuatara roaming free – though very slowly – within the 225ha predator proof fence that encircles the sanctuary. At the entrance, a smart new $18 million interpretive centre knocks our socks off with its multi-media conservation-themed exhibits. 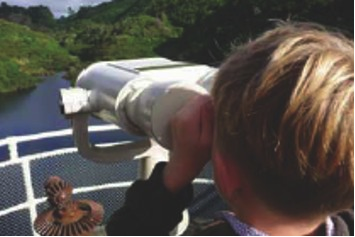 Between the indoor techno-wizardry and the kilometres of bushy hiking trails and dams to ramble round, Zealandia is ideal for two curious boys with energy to burn. It is equally enjoyable for adults, much like the other items on our Wellington “must do” list. This family trip to the capital city was never going to be a McHoliday. Generic eateries and overheated, unsanitary indoor playgrounds are revolting enough for parents on home turf; we have no intention of venturing near them on holiday. Nor do our children want late night theatre or long, leisurely dinners in hushed restaurants. So we focus on activities that are fun and stimulating for everyone, with the kind of city food and experiences we can’t find at home in the provinces. While husband, Marty travels here frequently for work, it’s been 10 years since I spent any time here and I’d forgotten how much I like this art and café crammed city. I marvel againat the pretty wooden homes perched precariously on San Francisco-steep streets. We find strangers who smile and chat and offer directions, gloriously good dining and, on this particular weekend, no wind. The harbour and hills form handy geographic barriers that keep the cafes and museums, galleries, theatres and the waterfront nicely tucked up against each other so all the essentials are walking distance from our hotel. Even the airport and zoo are less than 15 minutes’ drive from the compact, vibrant downtown core. Outer space is also remarkably accessible. Carter Observatory’s distinctive white domes sit in the city’s vast botanic gardens, a sedate cable car ride up from the main shopping drag of Lambton Quay. We strike an unseasonably clear, warmish, windless day so take our time on the garden’s edge, staring down over the high rises and the Cook Strait ferries ploughing to and from Picton. The observatory re-opened in March, after a $4 million-plus makeover designed to pull tourists as well as space geeks through the doors. They’ve done a great job, packing plenty of slick graphics, hands-on exhibits and the odd stray meteorite around the worthy heritage displays. Given its vast, distant subject matter, the space experience has a surprisingly local spin. 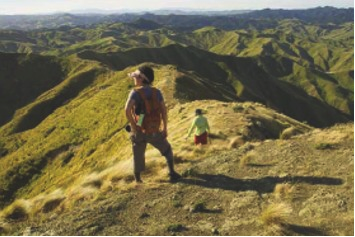 There’s plenty here on Maori navigation and mythology, our southern skies and Kiwi astronomers. On clear Saturday nights, the observatory roof slides open and visitors can stay late to peer through a grand old telescope. All four of us loved watching an animated astronaut movie clip, then star-spotting on the planetarium’s domed ceiling. Admittedly, it’s late in the day and those plush, red, specially reclined seats lull some of us dangerously near a nap. In my defence, our Wellington days are fast paced. We tick off the Sunday morning market (locally made Turkish delight, fresh pretzels, teeny cupcakes) and the Museum of Wellington. We visit the waterfront playground and the hotel pool, and I make sneaky side trips to smart boutiques. At the zoo, we dash between enclosures during a violent rain storm that grants us front-row viewing at every viewing platform. Unfortunately, most of the animals are also hiding from the weather, though the baby chimp’s antics with a pizza box send all four of us into gales of laughter. Inside Te Papa museum, our children lead the way to the giant squid lying in state in his glass-topped coffin, largely ignoring the surrounding printed text in favour of creating lurid virtual squid on computer monitors. We watched a three-dimensional movie about the critter’s capture. In the ‘my space’ section, the boys produced and embellished video clips, then manipulated them on a giant screen with bewildering ease. As an adult, ournational museum is thrilling and over-stimulating, magnificent and exhausting. Naturally, the boys wanted to know if they could return the next day. They’d quite like another week in Wellington. Actually, we all would, now we know the nation’s business briefcase political power city is really just a giant playground. Time to kill at Wellington Airport? Check out Wild At Heart, a sort of budget Koru club lounge with big screen tv, computers and internet access, snacks, beer and wine, proper coffee and hot chocolate. Bathrooms and showers included in the entry fee. It’s $15/adult on weekends, $12.50 for children, free for under-twos.